Jeff Nichols' newest film is perhaps his most genre film to date, but it maintained his high standard of artistry and quality. Beautifully directed and terrifically acted all around (except by Kylo Ren) with an engrossing mystery that was teasingly kept under wraps until the final, satisfying - and achingly beautiful - payoff at the end. Written and directed by Nichols, this film is a family drama masquerading as a sci-fi thriller. The opening scenes quickly established the premise and teased you enough to keep you engaged and guessing throughout. And Nichols as smartly left breadcrumbs throughout to constantly interest the audience. Sure, the exact premise is not exactly the most original, and most genres movie-goers would have guessed it soon, but the satisfaction actually comes from the actors and how the answer is revealed. Superb acting from Nichol's muse, Michael Shannon - showing once again that he is way overdue for some awards recognition, Kirsten Dunst - almost reprising her stunning performance in Melancholia, and Joel Edgerton - an under-rated actor that really sold his role with small actions and body language. 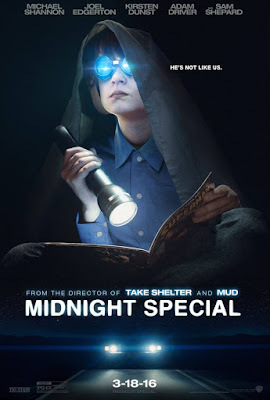 Even child actor Jaeden Lieberher, was convincing in his role as our mysterious protagonist. Unfortunately, Adam Driver - aka Kylo Ren - was the weakest link. Driver's character looked perpetually bored and he lacked the scientific wonder that would have been expected from such a character. It could also be that his plot thread was the most underwhelming. The music by David Wingo was beautiful and cinematographer Adam Stone did some glorious work here. Another win for Jeff Nichols and despite heading into genre territory, he still maintained that high standard of quality and artistry that defined his works. An amazing director to always look out for!